It did feel like the end of an era, like it was coming an end. It looked like the players had given up, the manager had given up and the fans had given up. For someone who has never sat on the fence and always given the manager 100% support, the fence seemed a lot closer at about 3.30pm on Sunday. We were not at the races, couldn’t pass, couldn’t create and certainly couldn’t defend. Roberto Martinez played with a false number nine and played Lakaku out wide to attack Nacho Monreal and it worked beautifully. Carzola and Poldolski had no real interest in tracking back and it left the full backs completely vulnerable to the counter attack. Quite simply, it was terrible and the squad looked shattered and mentally gone. It was a total contrast from last week’s second half display against Manchester City. Worth noting, we have not lost at home since the opening day defeat to Aston Villa in the league but our away record to the top 7 has been horrid (minus a wonder goal at Spurs and holding on a bit). For the first time, probably since 1996 was I beginning to think about the post Wenger era. Let’s get one thing straight, he deserves respect and some of what I have read, heard (at games) and even from broadcast and written journalists has been bang out of order. To put it in simply and in context, he has won more league title titles alone then Spurs have in their entire history. He has won the same amount of league titles as Chelsea have done since Roman took over and spent about a billion pounds (fees / wages / bonuses / sacking managers) and has the same amount of league titles as Manchester city (in their entire history). He is no fool, he may be stubborn and perhaps hasn’t moved with the times but he is a ‘legend’ at Arsenal football club and should always be remembered as a legend. I am convinced that in years to come, people will look back at the period after the stadium was built and think it really was a great achievement to keep Arsenal in Europe’s elite competition. We have seen Liverpool drop out and perhaps Manchester United dropping out this season (admittedly, it probably wouldn’t have happened under Fergie). It has and will lay the foundations for years to come and when competing with real super clubs financially, it was needed. I would agree with most that Arsene Wenger’s Arsenal have underachieved in the cups – keeping Arsenal in the top four but winning a cup or two would have helped ease the pain of not competing for the league (however, you can argue, we did compete until February in 2011 and March in 2008). This season, injuries have broken us. Aaron Ramsey our best player (this season), Theo Walcott our top scorer (last season) and Mesut Ozil, our new star man all injured at the same time has really affected us. Take Silva and Toure out of City, or Hazard and Oscar out of Chelsea or Suarez and Henderson out of Liverpool and they are likely to falter slightly. Injuries are not an excuse, you could argue that injuries come from being over played and that could be down to not having a squad big enough to play in three competitions at a time. Wenger stays or goes someone somewhere has to look at our injury record and find out why they keep happening over and over again. I’m not afraid to say that I am a massive Arsene Wenger fan and will not apologise for that and something inside really hurts when I hear the abuse he receives but at the end of the day, nothing lasts forever and everyone moves on one day. Perhaps another option is for Arsene to move upstairs; he clearly knows the club better then most and still is a big name in world football, you only have to read what Mesut Ozil said when he joined (Arsene Wenger was one of the main reasons why he joined). …But he did look like broken man post Everton (and perhaps post Chelsea from those who got to speak to him) – you think back before Bayern Munich last season and the famous ‘Why you look at me?’ press conference where Arsene was clearly rattled but he came back, dropped our captain and goal keeper and ended up getting more points then anyone in the Premier league in the year of 2013. This time round however, I’m not sure if the fight is there. Looking at the squad, it always seems like we are a few players away – in 2011, when we had Van Persie, Fabregas and Nasri, we thought that one or two additions and we are the finished article, then they left over two years and we have replaced them and again thought we are close but not enough happened last summer and nothing happened in January when we could all see we needed a striker. It was essential to buy a striker who will score us goals – perhaps there was an expectation that Theo will be our ‘goal scorer’ but you still need more. Giroud, clearly isn’t good enough to lead the attack, he is slower then Mertesacker on the turn and has been physically fatigued since January! He is a decent player and as part of a squad can be very useful but every team needs a proper goal scorer. We have a few players that we have learned a lot about this season, good and bad. We have figured out that Arteta is probably over the hill and lacks the physical fight to compete in the centre of the midfield. Surely a holding player with a physical presence will be up there along with a striker in the summer as a priority. Nacho Monreal looks suspect at left back (Gibbs is first choice but has had injuries) and we have too many similar players that all want the ball to feet and want to come infield and not track back. Arsene Wenger’s biggest strength has been sticking by his players. Arsene Wenger’s biggest weakness is sticking by his players. Recently, Arsenal have been getting rid of deadwood but some would argue average players are given a year or two too long and that comes from the faith Arsene Wenger shows in them where as, a more ruthless manager would get rid quicker. At the same time, if many supporters had their way then Aaron Ramsey would not be at Arsenal today. Arsene Wenger showed an incredible amount of faith when he was getting dogs abuse home and away (one clown even used to boo him when his name was read out at home – safe to say, I have had brought this up MANY times the muppet) but supported him and got him through it and Rambo has repaid the faith. The same can be said with Gibbs and even Theo Walcott. A few years ago in the first 5-2, Theo got bashed in the first half and many managers may have been tempted to take him off to save any more humiliation but not Arsene Wenger. Theo was left on and proved his manager right by scoring two terrific goals that only Theo could and in truth, has not looked back since. I remember speaking to Arsene Wenger at the Arsenal AGM and he was speaking very highly of Abou Diaby – he was the ultimate box to box midfielder with the physical presence that we are crying out for. The only problem? He is and has been injured for most of his career. I have no idea what Arsene Wenger will do at the end of the season – I can see an FA Cup victory as a good way to say farewell. 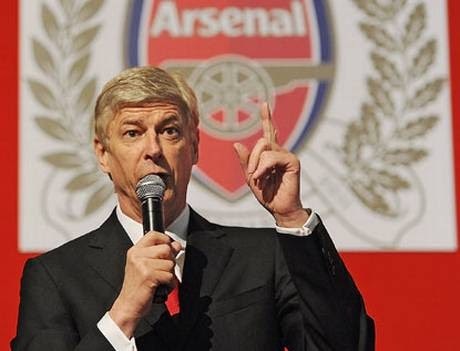 I think once the dust settles, even the ‘abusers’ will look at what Arsene Wenger has done at Arsenal and in England and be very grateful (three league titles, four FA Cups, CL final, Thierry Henry, 49 games unbeaten, which we are signing about at every game). Forgetting about Arsene Wenger for a second, the FA Cup is massive for the players too. They need some sort of silverware in order to believe they can achieve even more (leagues, CLs). Tasting success is what the players need in order to kick on under whoever is the manager. Taking a step back, if someone offered me a place in the top four and the FA Cup at the start of the season, I would have taken it and insisted it was progress. We have improved against the so called lesser teams and even learned how to win ugly a little, however we have also forgotten how to compete, let alone win at the bigger grounds. I still think we will finish in the top four purely because our run is easier and we do not have City or United coming to us or have to go to Southampton – three tough games for Everton. Arsenal will be competing against teams fighting for their lives but unlike Everton, we have the experience of a fourth place run in and a manager (despite looking broken) having the experience of a run in along with Ramsey back, Ozil coming back and hopefully Wilshere back at the end of the month too. I’ve never once considered not having Arsene Wenger as our manager next season but yesterday has certainly put the thought in my head – but football can change very quickly. Fourth place and an FA Cup and I’ll probably back believe he deserves another year or two. You can call me the confused Gooner this week. Great article. Never ceases to amaze me the level of abuse hurled at players and managers by people who have only ever played at the local park after a skinfull on Saturday night. If Wenger does leave, who is likely to replace him, and are they really going to be able to beat the Russian and Arab money machines? I'll exempt Liverpool as they have been supremely lucky with injuries and are unlikely to be as lucky next season. Be careful what you wish for Gooners. I certainly want him to stay but think he may decide himself to go - if that is the case then I hope we get 4th and the Cup for him. If he decides to stay, i hope we win the cup and get 4th so we can progress further. Great read Akhil! I fully agree with all your points and share your stance on Arsene. I hope we can finish the season with our heads held high and perhaps it's then time to say farewell. But only if there's a valid candidate ready to step in. I don't want change if there's no plan B ready. Like a certain charming (grinning) german ready to take the helm. Thank you. Agree on everything you say. Not sure how the board would react if he decides to leave. Arsene has put himself in a spot where fans can even doubt him, he is a legend , and he has earned it , but 9 years without a trophy is not good enough, please lets avoid sentiments. its time for him to take a walk. I think a little more light on why Wenger didn't buy a striker in January may have helped his cause. Nevertheless, he's a top top manager of our times. A legend surely for Arsenal. Hope he goes upstairs and continue to guide the club. Akhil it's good to hear support for our manager. It irks me alot that our fans forget the times immediately before Arsene after George Graham and how the club could easily have sunk in to the abyss there and then. I just feel that we don't have a mean streak in the side. Whilst Paul Scholes a few weeks ago was (wrongly) scathing on Sky Sports there was some truth in what he said. We lack back bone. You look at City - all flair, fluidity and grace upfront but the core at the back are solid. Kompany and De Michelis (he isn't great but he is no nonsense) and then if you have a look at Chelsea playing Cahill, Terry and/or Luiz with Matic in front. These are heavyweight players - solid. We just seem flimsy - since PV moved on. Even a tearaway player like a Balotelli would instill some aggression in to the team. Great comment and balanced too. Thanks. 100% agree on the steel / back bone. You need that. Must win the FA CUP - if we do not, the players will believe we will never win!